A few customers (notably in Universities and Government organizations) are reporting difficulties with installations that are file permissions related. This article is designed for showing the IT person what permissions to set where so that SyringePumpPro can run. Locate this directory for the user account which is to be used with SyringePumpPro. If you have multiple user accounts, then you will need to copy the contents of this directory to each user. The directory cache must be available for r/w operations by the user account that operates SyringePumpPro. Each run session temporary files are created and destroyed in this folder. The directory PPL and all files and subdirectories must be available for r/w operations by the user account that operates SyringePumpPro. Each run session temporary files are created and destroyed in this folder. 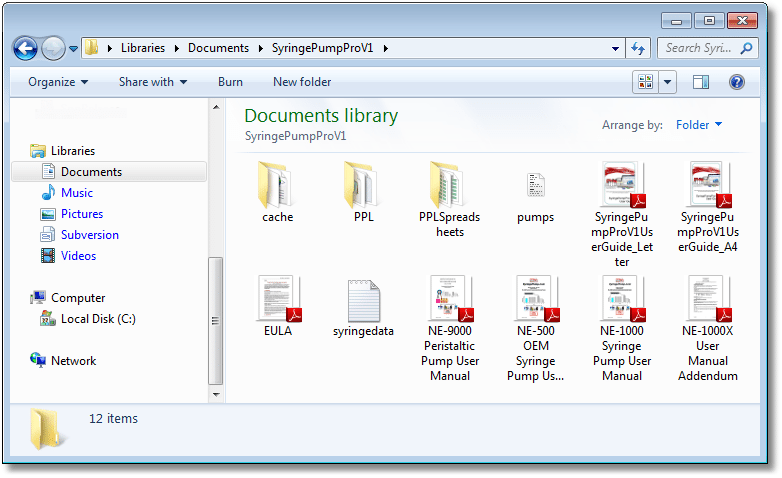 The directory PPLSpreadsheets must be available for r/w operations by the user account that operates SyringePumpPro. Each run session temporary files are created and destroyed in this folder. The file pumps – pumps.spplog needs to be r/w for the user account. The file syringedata – syringedata.txt needs to be r/w for the user account. With the above permissions set, SyringePumpPro should be fully operational for the user account. Please contact me and ask any questions or report any further issues you may have at your site. This will help me fine tune this for other IT guys/girls all over the world.